Explanation: The Plot shows different angles for both φ and ψ - from -180o to +180o. 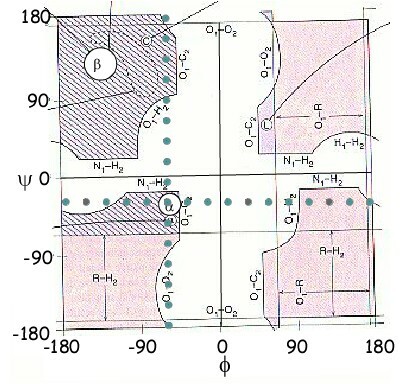 The white regions on the plot indicate angles where severe conlficts in atom positions in space occur and no amino acid adopts these positions. The pink regions indicate where conflicts occur with the β Carbon of an amino acid (glycine is the only amino acdi without a β Carbon). The dark purple shaded area indicate where no atoms conflict in space and thus these conformations are allowed. The cyan circes on the plot indicate the angles that can be demonstrated in the animation. The animation starts up holding ψ constant and changing φ. The "red ball" tracks on the plot what the animation is doing. You may also select any cyan circle to to stop the animation and inspect that postion in more detail. You may space fill the atoms at anytime or keep the sticks. The former helps to visualize why some positions are not "allowed" while the latter helps to visualize the angles.